BELLEFONTE, Pa. (AP) — Jurors in a defamation and whistleblower lawsuit were read testimony Wednesday by a former Penn State athletic director who denied a claim by a main witness against Jerry Sandusky that he was terminated as an assistant football coach because of his role in the child molestation case. The deposition by Dave Joyner, who was athletic director when Mike McQueary’s contract was not renewed at the end June 2012, said that new coach Bill O’Brien brought in his own staff. “My decision not to retain Mr. McQueary only relates to the fact that there was no employment for him, and his term was running out, and we did not renew it,” Joyner said in the 2013 deposition. 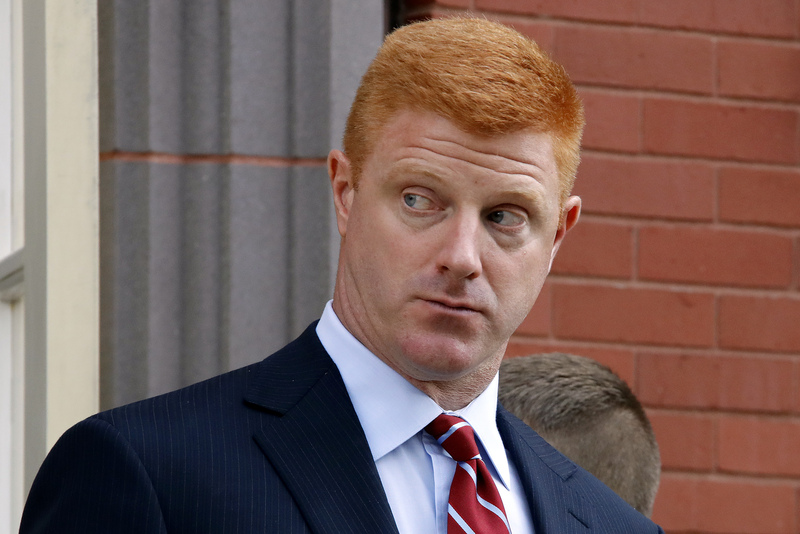 McQueary was put on paid administrative leave in November 2011, shortly after Sandusky’s arrest and the firing of longtime head coach Joe Paterno. The campus was in an uproar, and McQueary became the target of critics who questioned why he had not physically intervened or reported to police when he saw Sandusky abusing a boy in a team shower a decade earlier. McQueary ended up in financial straits when he was terminated not long after he testified against Sandusky, who was convicted of 45 counts of child sexual abuse, including several counts related to the incident McQueary witnessed. A few months later the school consented to pay him 18 months’ severance under terms of a letter agreement that McQueary and other coaches had been issued a few years earlier, to insulate them from changes that were expected when the aging Paterno ended his career. McQueary has not been able to find work since, and he is seeking more than $4 million in lost wages and other claims. Also Wednesday, an investigator said a raft of threatening emails and calls about McQueary that came in to Penn State in the days after Sandusky’s arrest were not enough to make him fear for the man’s safety. The university is defending its handling of McQueary, saying he was sidelined from the football program over safety concerns as the scandal broke and led to Paterno’s firing, caused the ouster of the school’s president and triggered a riot-type disturbance near campus. Sassano said investigators concluded McQueary and the public were not at risk when Penn State played Nebraska a week later. Evidence in the trial has included threats against McQueary and vague warnings that something could happen at Beaver Stadium if he showed up on game day. “That’s what they have 200 cops for at the stadium,” Sassano said. He described McQueary as a linchpin in the investigation of Sandusky, and of two high-ranking administrators charged for their actions in response to how they handled McQueary’s complaint in 2001. Sassano said he counseled McQueary against making a public statement in the aftermath of the arrests, even though McQueary expressed dismay that he was being heavily criticized. “You don’t respond to these kooks or nuts out there who are threatening you,” Sassano testified. Another witness, State College physician Dr. Jonathan Dranov, described how a visibly upset McQueary told him the night of the shower incident that he heard sexual sounds coming from the shower, then saw Sandusky and the boy. Dranov advised McQueary to report it to Paterno the next day, which he did, but authorities didn’t find out about the incident for nine more years. Under questioning by a Penn State lawyer, Dranov said he did not tell McQueary to report it to child welfare authorities or to police, nor did he or McQueary’s father suggest they return to the locker room to check on the boy’s welfare. “It was our impression the incident was over,” he said.